Weeks ago, 5 Minutes for Mom invited 100 people to try out a box of Trix cereal. This was no simple try-me-out-to-see-if-you-like type of deal. 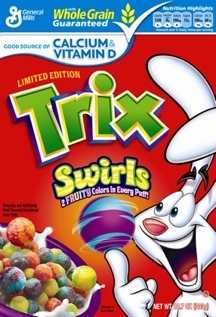 Trix is running a contest that begs the question, "How did those fruity colors get swirled together?" A big rock smashed into Trix Land and it was a big explosion of color. for the child(ren). YES, I did just say $1000!!! I'm crossing my fingers in hopes of winning. Kaden wants to take guitar and swimming lessons and Mariah would make a great ballerina.